Yup, you heard that right, SDMB is building a bike park in Tucson!!! 100-Acre Wood Bike Park will be located just northeast of the corner of Alvernon and Golf Links at 2681 S. Alvernon Way. 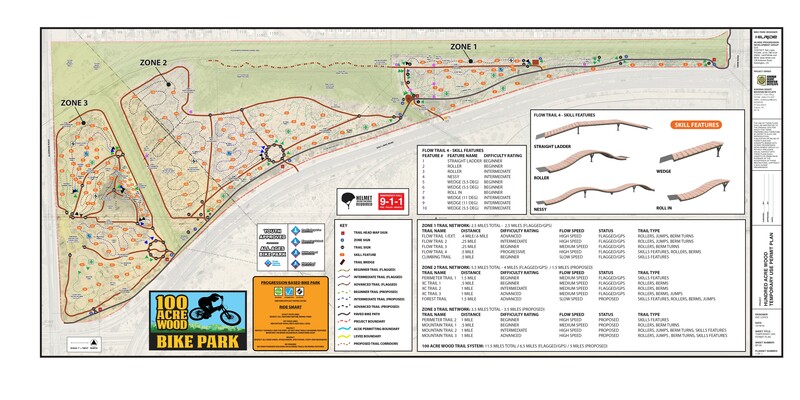 100-Acre Wood Bike Park is a partnership between SDMB, the City of Tucson (including the Office of Mayor Rothschild and Parks and Recreation) and Davis Monthan Air Force Base. The bike park will be funded through donations, sponsorships, grants, in-kind donations, and a whole bunch of volunteer labor. SDMB has partnered with the Tucson Parks Foundation for fundraising - GO HERE TO MAKE A DONATION, AND CHOOSE 100-ACRE WOOD BIKE PARK. The total cost for the project is roughly $2.5 million. This includes the parking lot, park amenities, and central skills area including dirt jump park, pump tracks, expo area, and kids’ area. It will take several years to raise all of the funds necessary to complete the project, so construction will be implemented in phases. After more than 2 years of planning and 800 volunteers hours of cleanup and site prep, Phase 1 will begin in 2019 and will consist of building approx. 7 miles of MTB-specific trail, including directional flow and XC trails. There will be no parking on site during Phase 1, and users are directed to park at nearby spots like Freedom Park Golf Links Park, and Veteran's Memorial Plaza. Phase 1 is expected to take 18-24 months to complete, and has an expected budget of $265,000. How can you support? 100-Acre Wood will be an entirely grassroots-funded bike park, which means that the entire community will need to help us make it happen. Services/Materials/Equipment: Email trailsteward@sdmb.org if you want to donate services, materials, or equipment. Fencing: We need a 40' x 80' yard fenced in. Clean Fill & Rock: Really big rocks. Join: SDMB is a membership-driven organization, and all membership dollars help us build and maintain trails in Tucson and Pima County. Volunteer: Follow 100-Acre Wood Bike Park on Facebook and join the SDMB newsletter. If you want to get more directly involved in leadership or fundraising, email trailsteward@sdmb.org.